Rabbit recombinant monoclonal CD11b antibody [EPR1344]. Validated in WB, IHC and tested in Mouse, Rat, Human, Pig, Rhesus monkey. Cited in 41 publication(s). Independently reviewed in 24 review(s). Synthetic peptide within Human CD11b aa 1-100. The exact sequence is proprietary. 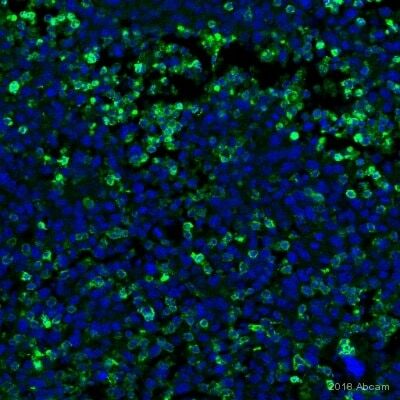 THP1 cell lysate treated with TPA, and TF1 cell lysate; Human tonsil and spleen tissues; Rat spleen lysate. Our Abpromise guarantee covers the use of ab133357 in the following tested applications. WB 1/1000. Predicted molecular weight: 127 kDa. IHC-P 1/4000. Perform heat mediated antigen retrieval with citrate buffer pH 6 before commencing with IHC staining protocol. Please optimize IHC protocol when testing mouse and rat tissues. It is easy to show background staining in liver tissue. Immunohistochemical detection of immune cell-related markers was performed on paraffin-embedded sections obtained from the back skin of IMQ-induced mice treated with vehicle or rottlerin. 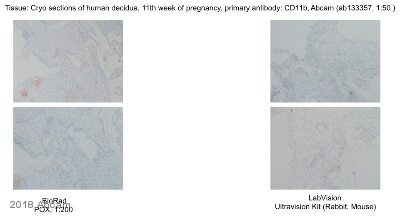 Representatives IHC images of CD11b (B) on the skin of the vehicle or rottlerin-treated mice. Scale bar = 100μm. Quantification analysis of IHC staining for CD11b(E) on the skin of the vehicle and rottlerin treated mice. Two independent researchers counted the number of positive staining cells were per high-power field (HPF). The data are representative of three experiments (n = 5 mice per group). ** P<0.01 vs. vehicle. Ab133357 staining CD11b in paraffin embedded Mouse lung tissue sections by Immunohistochemistry. 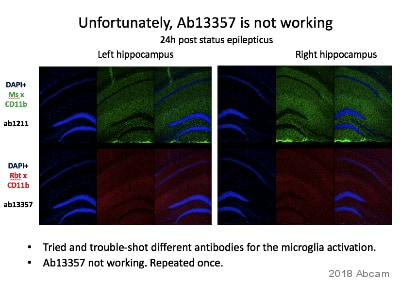 Heat mediated antigen retrieval was performed using ab93684 (Tris/EDTA buffer, pH 9.0). Samples were incubated with primary antibody at 1/4000 dilution (0.031 μg/ml). 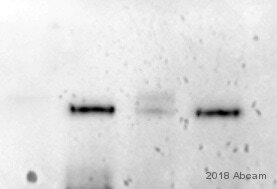 A ready to use Goat Anti-rabbit IgG H&L (HRP) was used as the secondary antibody. Hematoxylin was used as a counterstain. Positive staining on stromal cells of mouse lung. Ab133357 staining CD11b in paraffin embedded Mouse colon tissue sections by Immunohistochemistry. Heat mediated antigen retrieval was performed using ab93684 (Tris/EDTA buffer, pH 9.0). Samples were incubated with primary antibody at 1/4000 dilution (0.031 μg/ml). A ready to use Goat Anti-rabbit IgG H&L (HRP) was used as the secondary antibody. Hematoxylin was used as a counterstain. Positive staining on stromal cells of mouse colon. Ab133357 staining CD11b in paraffin embedded Rat cerebrum tissue sections by Immunohistochemistry. Heat mediated antigen retrieval was performed using ab93684 (Tris/EDTA buffer, pH 9.0). Samples were incubated with primary antibody at 1/4000 dilution (0.29 μg/ml). A ready to use Goat Anti-rabbit IgG H&L (HRP) was used as the secondary antibody. Hematoxylin was used as a counterstain. 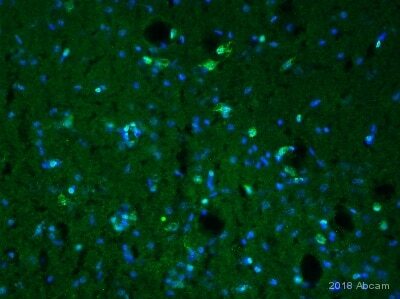 Positive staining on gliocytes of rat cerebrum [PMID: 20483006]. Formaldehyde-fixed, paraffin-embedded rat bone marrow tissue stained for CD11b using ab133357 at 1/5000 in immunohistochemical analysis. Heat mediated antigen retrieval with EDTA buffer pH 9 was performed before commencing with staining protocol. 1% casein was used as blocking agent. 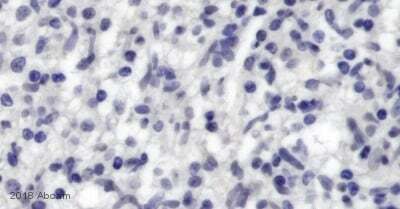 IHC image of CD11b staining in a formalin fixed, paraffin embedded human normal spleen tissue section*, performed on a Leica Bond™ system using the standard protocol F. The section was pre-treated using heat mediated antigen retrieval with sodium citrate buffer (pH6, epitope retrieval solution 1) for 20 mins. The section was then incubated with ab133357 at 1/4000 dilution, for 15 mins at room temperature and detected using an HRP conjugated compact polymer system. DAB was used as the chromogen. The section was then counterstained with haematoxylin and mounted with DPX. Immunohistochemical analysis of CD11b in paraffin embedded human spleen tissue, using unpurified ab133357 at a dilution of 1/100. 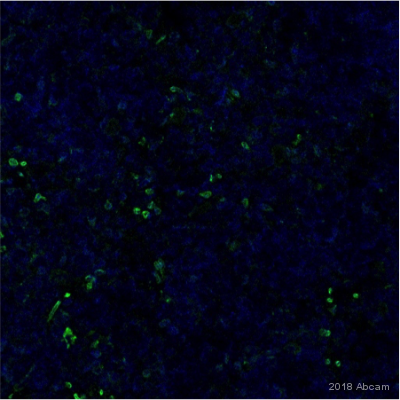 Immunohistochemical analysis of CD11b in paraffin embedded human tonsil tissue, using unpurified ab133357 at a dilution of 1/100. Immunohistochemical staining of paraffin embedded human spleen with purified ab133357 at a working dilution of 1 in 4000. The secondary antibody used is a HRP goat anti-rabbit (ab97051). The sample is counter-stained with hematoxylin. Antigen retrieval was perfomed using Tris-EDTA buffer, pH 9.0. PBS was used instead of the primary antibody as the negative control, and is shown in the inset. Publishing research using ab133357? Please let us know so that we can cite the reference in this datasheet.